A dire turkey has a wingspan of about 12 ft and weighs about 200 lbs. They have hundreds of buckler-sized feathers, and males have wattles. 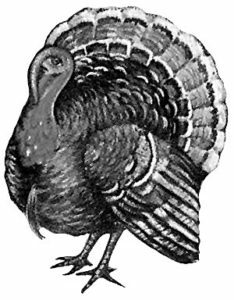 Dire turkeys of both sexes have spurs of bone on their lower legs. Unlike normal turkeys who are very cautious birds and will run or fly away at the first sign of danger; dire turkeys are fierce opponents who do not back down from fights.. The dire turkey attacks using its razor sharp talons and its piercing beak. The wild turkey has keen eyesight and is very stealthy as such they gain a +8 racial bonus on Spot and a +4 racial bonus on Hide checks. *In areas of tall grass or dense underbrush the hide bonus rises to +8. Tomnus is an imposing dire turkey. He stands nearly 9 ft tall and weighs close to 300 lbs, but moves with a swiftness and agility of a much lither creature. He prefers to rely on his spell-like abilities to quickly end a fight (that way he can get back to his true love – feasting), but is capable of dealing out tremendous damage with his natural weapons when angered. The beast lord can assume any humanoid form of Medium size or smaller as a standard action three times per day. This ability functions as a polymorph spell cast on itself at 13th level except the beast lord does not regain hit points for changing form and can only assume the form of a humanoid. The beast lord can remain in its animal or humanoid form until it chooses to assume a new one or return to its natural form. Immunity to ability damage, ability drain, energy drain, petrification, poison, polymorph, mind affecting effects. An aspect does not age, and does not need to eat, sleep, or breathe. An aspect cannot die except by extraordinary circumstances such as magical or physical combat. 3/day – divine favor, enthrall; 1/day – magic vestment, discern lies, greater command. Tomnus the Gobbler is the king of the turkeys. He spends much of his time in human form as a foppish overweight noble (picture Don Giovanni from Robin Hood: Men-in-Tights) who always seems to get himself invited to whatever lavish feast is nearby. At the feast he can be counted to gobble up more food than anyone in the room, but is especially drawn to sweets. When dragons make war, Krynn can only temble in the shadow of angry wings.